When it was announced that The Joker was going to be reintroduced into DC's new 52, I would have probably met that news with a shrug had it not been married to the Scott Snyder/Greg Capullo team. These guys are doing some of the best work in Batman comics today and they're doing it with gusto. The Joker is the defining villain of Batman's, his ultimate arch-enemy, but he's been largely absent from the pages of Batman. 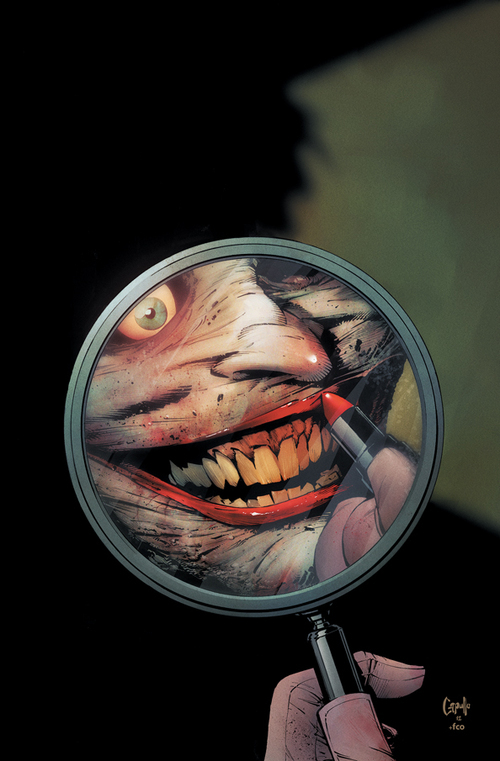 Scott Snyder:If you think about it, Joker hasn't had a big starring role in Batman in a long time. When do you think the last one was? Bryan Young: Jeez. You'd probably have to go back to... No Man's Land? SS: Yeah, that's right. The death of Sarah Essen. He's ubiquitous in the popular culture but he hasn't had a big starring role in Batman proper. Talking to Scott about his work with the Joker, there's an unbridled enthusiasm in his voice. It's an enthusiasm he's had since before his first comic book even hit the newsstands. I interviewed Scott way back in early 2010 about the pending release of American Vampire and we ended up spending two hours on the phone after the interview just talking about how much we liked Batman and what we liked about it. He's one of the few people on Earth I feel like I can actually wear the full force of my Batman knowledge and love on my sleeve with. SS: This is my exploration of who the Joker really is. Not literally though. I have no interest in his backstory. In fact, the comedian elements of The Killing Joke are the only thing that keeps it down for me. This is about who he is and what he means to Batman. Writing the Joker is dark. I was writing this morning and my wife came in and I was trying to decide what to lop off a character. He's just so unhinged and it's so fun to write. SS: The Killing Joke, I read it when it came out, it stunned me. And The Dark Knight Returns, they came out around the same time. The psychological connection between Batman and Joker spoke to me. Another one of my favorite iterations has been the underrated Batman Beyond: Return of the Joker. SS: First off, this is a standalone story, you won't need to read any of the other books about this Joker story, but you will see him in the other Bat family books. He has a bone to pick with the entire family and you'll see him across the others, even Teen Titans, because he's got his issue with Tim. Ever since the start of the new 52, DC wanted the Joker to be absent. They wanted to start using other villains. But ever since the Court of Owls, I've been thinking about ways to use him. And I told them that I have this Joker story for after that's just great. It's my love letter to the Joker. It's crazy and twisted. This is about his psychology. He's there to burn the house down and prove a point. BY: Joker seems to be the character who leaves the most defining scars on the Bat family that seem permanent. Or mostly permanent. He killed Jason Todd. He crippled Barbara. He killed Sarah Essen, and a whole bunch of other stuff. It's what he's known for. Will we see something that definitive affect the Bat family in the aftermath of all this? SS: Yes. There will be big, bloody repercussions. He's going to leave serious scars. That's not the point of the book, but that's how the Joker operates. It's who he is. More than anything, this conversation with Scott assured me that we're still in good hands. It's been a while since I enjoyed reading my Batman comics this much and I'm grateful to Scott for that. And bloody repercussions? I like the sound of that. The Joker arrives in Batman #13, which doesn't hit stands soon enough. Bryan Young is the author of the critically acclaimed Operation: Montauk and the editor of the geek news and review site Big Shiny Robot!